TerminalServiceAgent 1.0 is remote computing software developed by Nsasoft LLC..
TerminalServiceAgent allows to enumerate and control network terminal services and processes and allows to terminate or log off remotely. 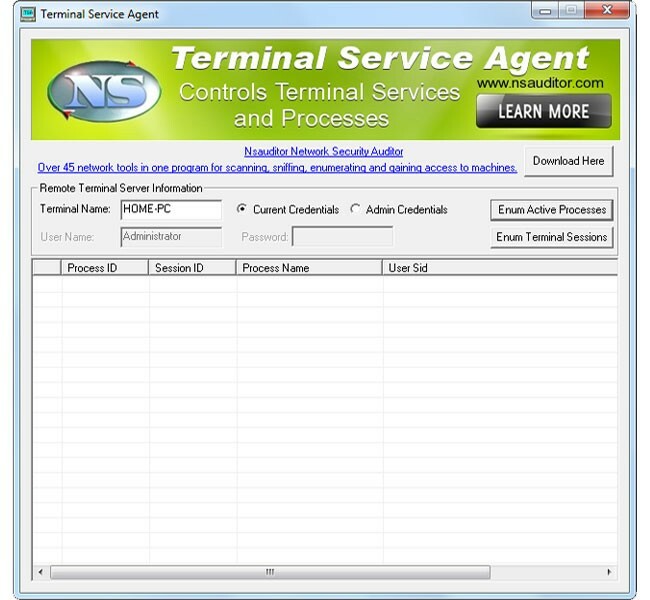 TerminalServiceAgent shows remote network terminal service information like Initial Program, Application Name, Working Directory, OEM Id, Session Id, User Name, Windows Station Name, Domain Name, Connect State, Client Build Number, Client Name, Client Directory,Client Product Id, Hardware Id and more. This network & internet program is freeware, so you can download and use it absolutely free. TerminalServiceAgent 1.0 supports English interface languages and works with Windows XP/Vista. Latest TerminalServiceAgent 1.0 does not contain any spyware and/or advertise modules, allowing installing it with no worries concerning valuable information loss. Our website has thoroughly tested network & internet product TerminalServiceAgent 1.0, written the review and uploaded installation file (437K) to our fast server. Downloading TerminalServiceAgent 1.0 will take several seconds if you use fast ADSL connection. Remote Desktop Connection Client for Mac allows you to connect to a Windows-based computer and work with programs and files on that computer from your Macintosh computer. AT&T Global Network Client is software that allows you to connect to a variety of dialup services.